With the recent proliferation of devices and applications, Information and Communication Technology (ICT) is increasing its impact on the environment due to its resource and power consumption. However, ICTs can make also a significant contribution to saving energy, by autonomous optimization efforts and by inducing changes of user behaviour attitudes and values. A variety of research work on Green ICT has focused on measuring the level of greenness of hardware components from an environmental perspective. In the last years, there has been an increasing interest in having clear metrics for measuring the carbon footprint of software, the amount of resources used by software, and how it affects the environmental impact of ICT. However, measuring software sustainability is a challenging task, due to the complexity of its direct and indirect effects on the environment. More empirical evidence on the performance and reliability of the proposed metrics is required. 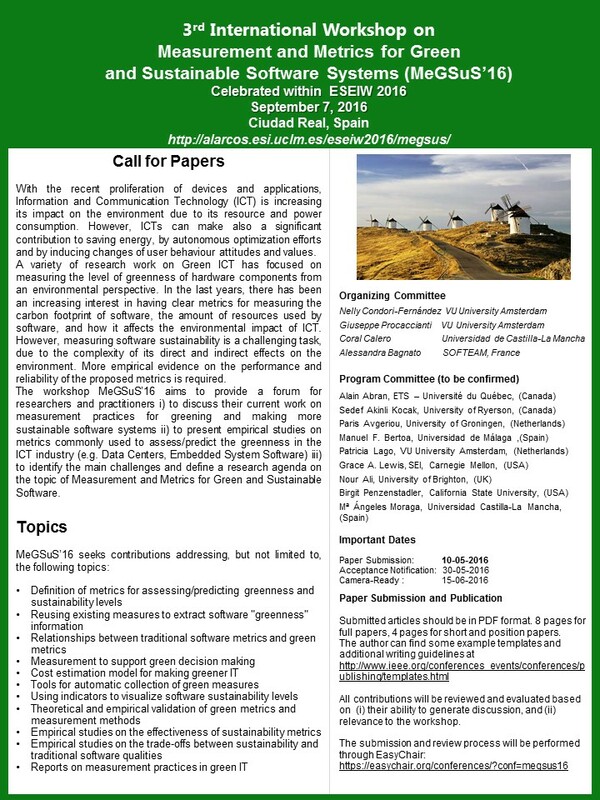 The workshop MeGSuS’16 aims to provide a forum for researchers and practitioners i) to discuss their current work on measurement practices for greening and making more sustainable software systems ii) to present empirical studies on metrics commonly used to assess/predict the greenness in the ICT industry (e.g. Data Centers, Embedded System Software) iii) to identify the main challenges and define a research agenda on the topic of Measurement and Metrics for Green and Sustainable Software. Marco Bessi presentation is available! Natalia Juristo presentation is available! Joe Peppard presentation is available! Claes Wohlin presentation is available! 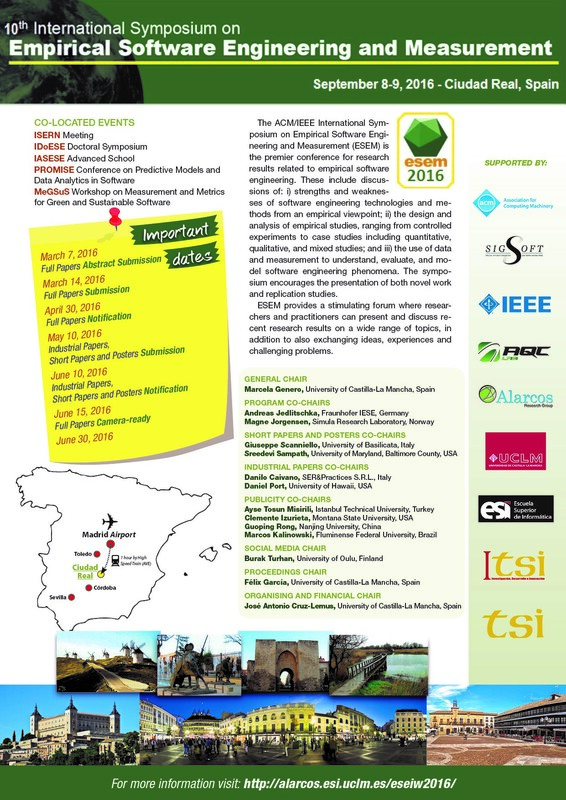 Welcome to the website for ESEIW 2016. Ciudad Real (Spain) September 5-9, 2016.